From left to right Paco , Manny Oquendo , Charlie Palmieri, Mongo Santamaría , Sam Scavone and Dave. Born José Manuel Oquendo on South Fourth St. Brooklyn, he was called "Manolo" before he became "Manny" in his teens. The family later moved to East Harlem in 1939 where Oquendo was captivated by the sounds of music. “Music was everywhere,” he recalled. East Barrio’s first Latin music record store “Almacenes Hernandez” (originally located at 1600 Madison Avenue and opened in 1927) was just one flight down from the Oquendo family's apartment. The swinging big bands of Machito, Jose Fajardo and Orquesta Aragon became the soundtrack of his childhood. "There was music constantly coming out of that store, and that was my education," he recalled. 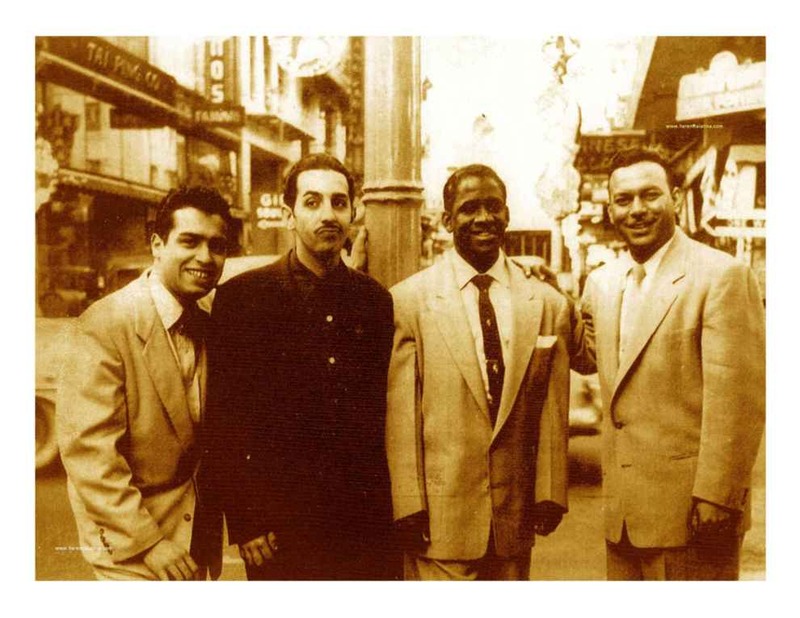 From left to right Charlie Palmieri, Manny Oquendo, Mongo Santamaría and Vicentico Valdés. At the "ChinaTown" from San Francisco, California, 1952. Taken from "Salsa and Latin Jazz Calendar, 2007". Jesse "Chuy" Varela. Oquendo began playing with New York's top orchestras. He played with the Carlos Medina Orchestra, the Charlie Valero Band and Xavier Cugat’s former singer Luis del Campo before playing with the legendary Marcelino Guerra Band. 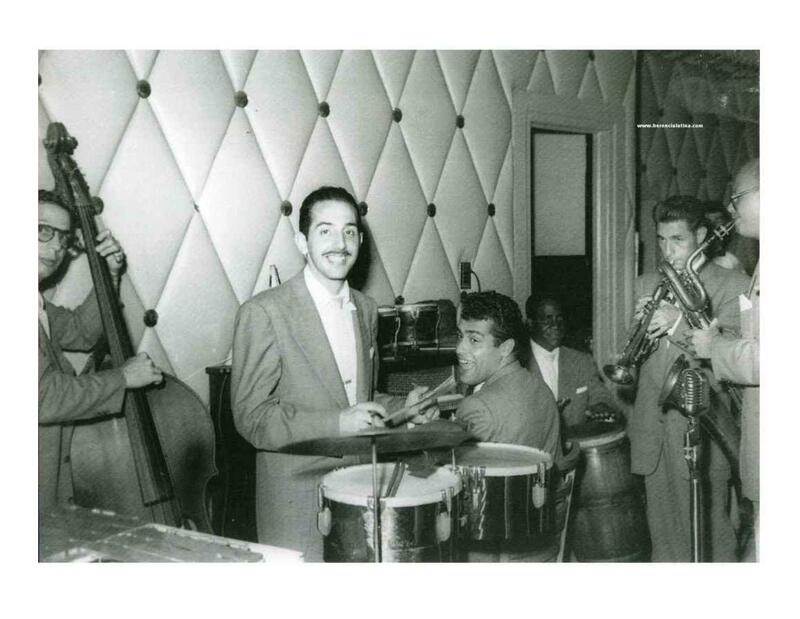 In 1963, Manny Oquendo joined "La Perfecta," the conjunto organized by pianist Eddie Palmieri. Alongside congüero, Tommy Lopez, Manny crystallized the Mozambique sound creating a powerhouse rhythm section alongside Palmieri’s improvisational infrastructure. In 1974 Oquendo and bassist Andy Gonzalez left Palmieri to move in their own direction. Leaving the traditional structures behind, the duo incorporated jazz, Afro-Cuban, Afro-Puerto Rican rhythms while exploring alternatives. The goal was to “free” the music from restrictive content and Libre was born. During 1976 to 1981, Oquendo became a musical historian of the tipico sound he'd perfected with Palmieri. Libre's first albums included classics by composers Ignacio Pineiro, Rafael Hernandez and Nico Saquito, as well as a traditional Puerto Rican plena by Manuel "Canario" Jimenez. At the same time, the group attracted a creative crop of innovative young artists in Latin music. The Gonzalez brothers, Andy and Jerry Gonzalez are founding members; Alfredo de la Fe is featured on various incendiary violin solos with singer Herman Olivera making his recorded debut over a Libre recording while flautist Nestor Torres was also a featured guest. At various times, Barry Rogers, Jose Rodrigues, Angel "Papo" Vazquez, Jimmy Bosch, Reynaldo Jorge, Dan Reagan and Steve Turre held down the trombone line, while Oscar Hernandez, Joe Mannozzi, and Marc Diamond rocked the piano chair. According to Manny Oquendo's wishes, there will not be a viewing. We will post any information regarding a memorial in the future.